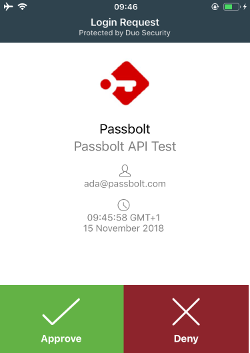 Passbolt Pro Edition since v2.5 supports Duo as a multi factor authentication option. 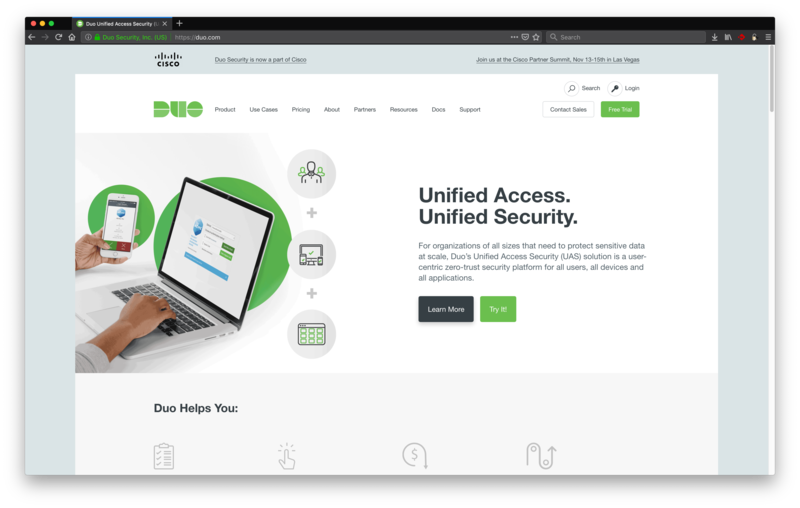 Duo is a proprietary solution that is free for up to 10 users, and supports a bundle of authentication channels (such as HOTP, mobile push, phone calls, etc.) configurable by the Duo account administrator. 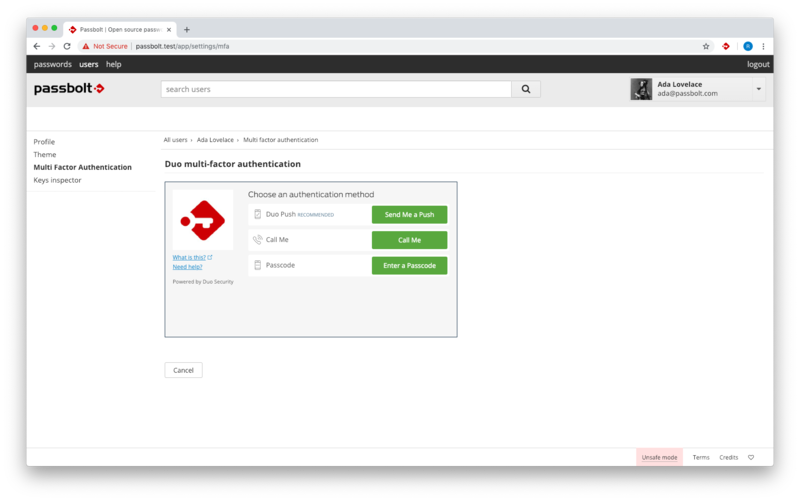 It is important to enable and setup at least one additional multi factor authentication provider in case Duo service becomes temporarily not available. 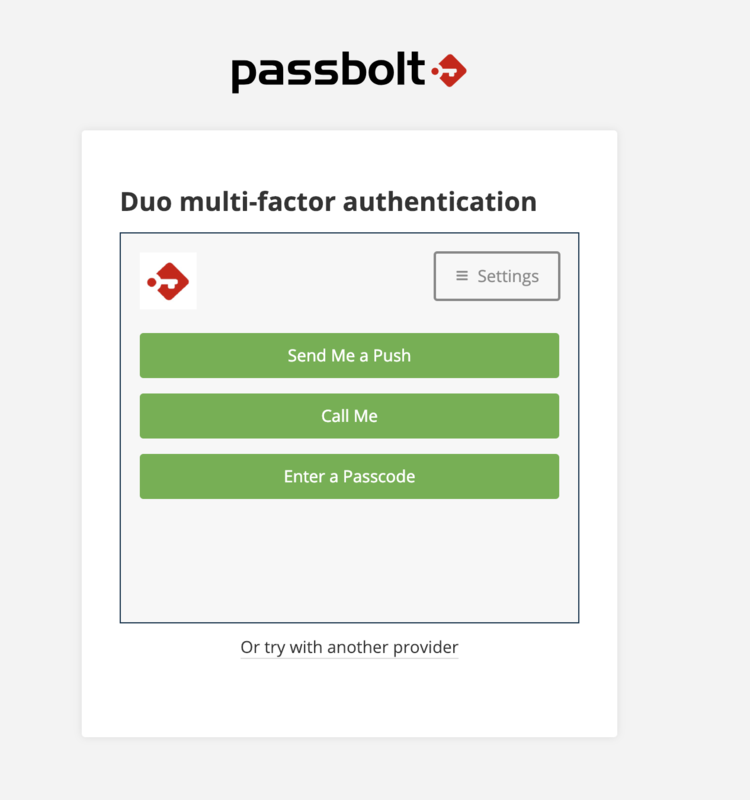 In order to use Duo authentication the user will need to interact with an iframe with content served by passbolt. Make sure your users have access to internet or do not enable this authentication provider if you are running passbolt on a private network that is not connected to internet. In order to use this authentication provider each of your users will need to install the Duo mobile app on their phone or tablet. Duo Mobile for Android on google play store. Duo Mobile for iOS on apple itunes. Configure your Duo policies as required by your organization. In order for passbolt to enable onboarding and authentication of new users with Duo, you will need to create a passbolt application in Duo. When login in Duo Admin panel in the left menu, click on “Applications”, then click on “Protect an Application”. 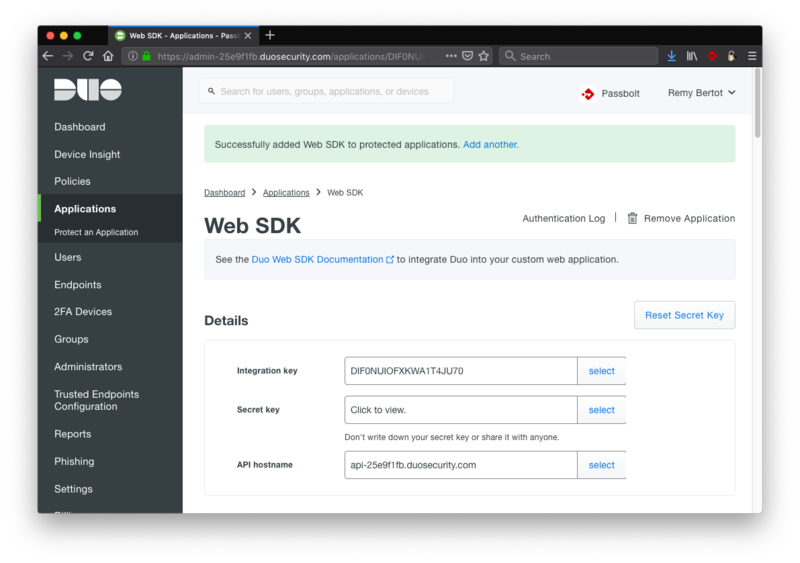 Find the “Web SDK” application and click on “Protect this Application”. 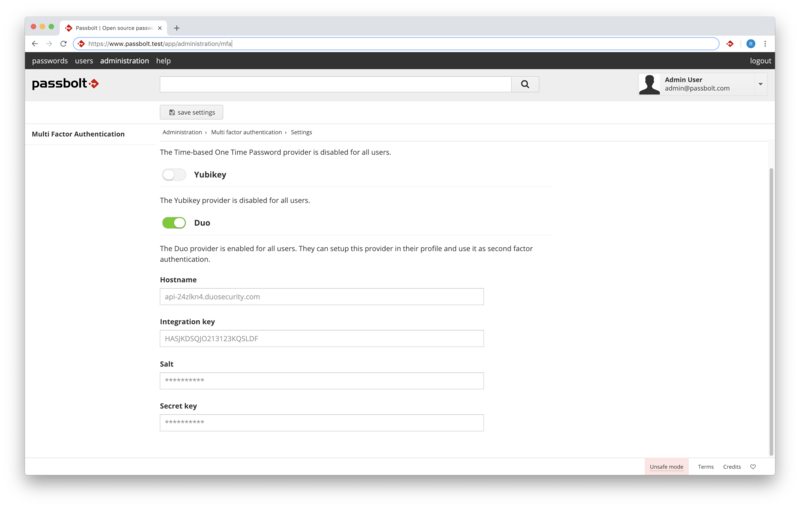 Note down the Integration Key, Secret Key, and API Hostname details, as you will need them to configure the integration. You can either configure Duo in passbolt using the user interface, or files or environment variables. If multiple settings provider are used the settings in the UI will override the one used in files. Similarly The settings in files will override environment variables. You will need to generate a random 40 character string to be used as salt, to help secure your integration. Once you have a the Duo integration configured and Duo app installed on your mobile you can proceed with enabling Duo as provider for your user account. It is important you test this to make sure the integration works. When logged in passbolt go to your profile section and click on “Multi factor authentication” in the left sidebar. You should see the list of providers that are enabled for this instance. Click on the Duo provider. Passbolt will then display an iframe that will help you setup your device if this is the first time you are using Duo with this instance. Follow the instructions provided by Duo and you should be all set. The next time you try login from a new device, you will be presented with a Duo authentication prompt.